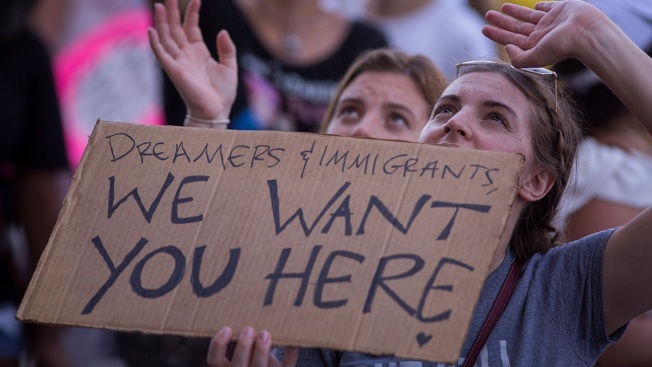 The man told NBC News he was sharing his story to show Trump "we are not a burden and we are not what he thinks"
In this June 30, 2018, file photo, people protest President Donald Trump's administration's immigration and refugee policies in Los Angeles, California. An undocumented immigrant said he was a caretaker at a shooting range co-owned by President Donald Trump’s eldest sons and that he worked without authorization at one of the president’s golf courses before he lost both jobs this year. The caretaker — Juan Quintero, 42 — told NBC News he worked at the Trump National Golf Club Hudson Valley in Hopewell Junction, New York, from the year 2000 until he lost his job in January, when the Trump properties took action to purge its employees who were working illegally. He said he also worked at the Leather Hill Preserve hunting range in Wingdale, co-owned by Eric Trump, Donald Trump Jr. and others, from 2016 until this year. The Trump Organization did not respond to NBC News' requests for comment.